The sitcom Vicious has just started airing on PBS stations this past weekend and it certainly lives up to its name. 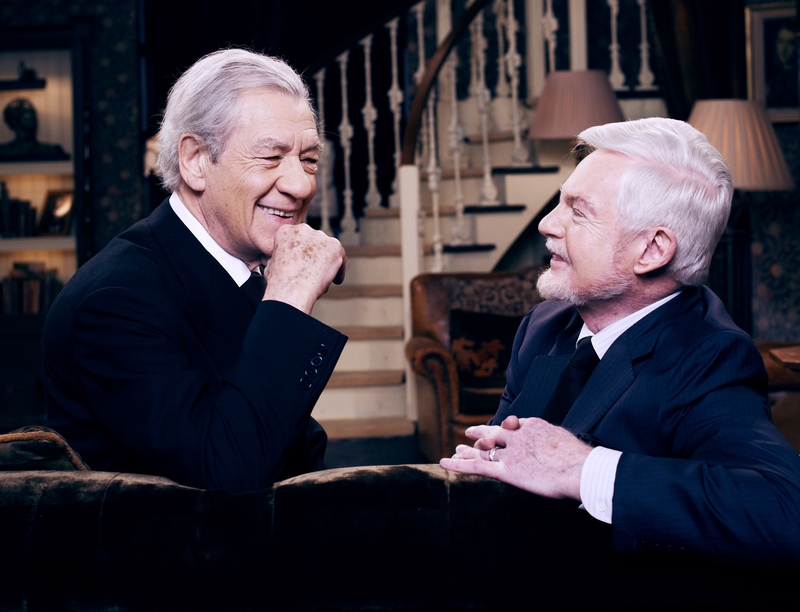 Starring British acting legends Ian McKellen and Derek Jacobi, the two play a gay couple who’ve been together for almost half a century. A lifetime of companionship has worn on their collective nerves and most of what remains between them is catty remarks, primarily from Freddie (McKellan), and not just a little resentment on the part of Stuart (Jacobi). For example, let’s consider Basil (John Cleese) and Sybil Fawlty (Prunella Scales). They’re the perfect example of a defective marital situation. Bossy Sybil is verbally abusive which intimidates Basil forcing him to resort passive-aggressive name calling. Their private conflicts often become public and are played out in front of the guests of their seaside hotel, Fawlty Towers. It’s a nasty perpetual cycle that would require a great deal of marriage counseling in the real world, but when put on for our entertainment, it’s just classic sitcom fun. One of my favorite contentious telly pairings is workplace-related and features Life on Mars’ DCI Gene Hunt (Philip Glenister) and DC Sam Tyler (John Simm). When you’ve traveled back in time thirty years and suspect you might be mad or in a coma, it takes a bit of time to get used to your new reality. Combine that with a thoroughly bigoted boss with whom you can’t see eye to eye, is it any wonder Sam is having such a tough time? Here Gene and Sam “debate” the best way to handle a hostage crisis. Gene and Sam actually make a good crime solving team because of their different approaches to policing, but it sure is an exhausting way to get the job done at times. Anyone familiar with Dr. Martin Ellingham (Martin Clunes) and Louisa Glasson (Caroline Catz) knows that their romance has been a long and rocky road from the very first day they met on a flight to Cornwall. Since then Doc Martin and his lady love have butted heads countless times; through courtship, the birth of their son and now the challenges of marriage. Their on-again-off-again relationship continues to fluctuate wildly because Martin is unable to read people’s social cues (some have said Asperger’s) and Louisa’s expectations of her mate are totally unrealistic. The volatility of this often inexplicable liaison and its “will they/won’t they stay together” quality has surely hooked viewers into caring about Martin and Louisa, especially now that they have a son. However, if you’re like me, Series 6 pushed me to almost wish that they’d just pack it in. Then of course there’s the beautiful yet infuriating sibling bond perfectly illustrated by the Goodman brothers, Adam (Simon Bird) and Jonny (Tom Rosenthal). Despite the fact that they are grown men, when placed in the same room together they revert to what I assume is their pestering, immature childhood selves. Insulting nicknames, practical jokes and a physical tussle here and there are all par for the course when Adam and Jonny gather for the obligatory Friday Night Dinner. Parents beware! I can tell you from first-hand experience, this type of regression does occur and it can be concerning when you realize these are the people who are going to be looking after you in your golden years. And finally for anyone who has had a roommate in college or beyond, you know how delicate the whole arrangement can be. Some people are forced together who really aren’t suited for co-habitation. In Bottom, we see an extreme example of this incompatibility because Richie (Rik Mayall) and Eddie (Adrian Edmondson) probably shouldn’t be living with other human beings, let alone one another. Eddie doesn’t put on any airs. He’s an amiable drunken hooligan who cheats the dole and doesn’t care what anyone thinks of him. Desperately needy Richie, on the other hand, is in the same financial straits yet considers himself to be superior to his flat mate. The coming together of these personalities is bound to create friction. Despite the fact that they choose to live together, their violent altercations, dimwitted schemes and general inability to get along should be a warning to us all that friends often don’t make the best roomies. Be they co-workers, siblings, flat mates, or romantic partners of various descriptions, human interaction is fraught with opportunities for discord. While many of us avoid the type of confrontation we see on TV for the sake of harmony in our lives, watching fictional characters play out our conflicts with spiteful comments and open disdain might actually be therapeutic…and quite often humorous as well. Vicious airs on many PBS stations Sundays, June 29 to August 3, 2014, 10:30-11:00 p.m. ET. Check your local PBS schedule for dates and times in your area.